The Leadership Trust® was granted its registered trademark in the 1990s to capture the essence of highly effective leadership: Trust. Regardless of conceptual methodologies employed (e.g., self-awareness and emotional intelligence processes), the “holy grail” remains trust. It is the end of the means. We discovered Trust Across America – Trust Around the World eight years ago, thanks to one of our faculty members, Edward Marshall. ►All team members enthusiastically share ideas without fear of certain dominant members over-riding them – or worse yet, being publically chastised or embarrassed. ►Credit being shared as a team effort rather than from one key player. ►Enjoying clearly communicated directives and words of support and appreciation. ►Work being fun! When stress and tension are well managed, and trust abounds, work becomes fun. No matter how looming the deadline and unexpected the challenges, when the team works in concert like a well-oiled machine, you can experience the unmistakable flavor of “serious fun” to infiltrate the company culture. The above is only a partial list. The more inclusive, comprehensive list can be found at http://trustacrossamerica.com/tap-into-trust.shtml Once your team has achieved mutual trust amongst all team members, you can expect focused communication void of debilitating stress and tension. You can expect increased morale, productivity, and revenue. You can expect this as a given. So how do you achieve this level of trust? It starts on the individual level, and the ripple effect is measurable. The Leadership Trust® guarantees its leadership development programs will manifest within its participants a palpably heightened level of self-awareness (which is really other-awareness) that fuels the same level of emotional intelligence. Trust is naturally spawned. If you are serious about creating a culture of trust, there are multiple ways to successfully achieve this goal. The Leadership Trust® offers workshops, team building retreats, and organizational improvement projects – and all work is guaranteed. You will find additional solid resources at Trust Across America – Trust Around the World http://www.trustacrossamerica.com. The Leadership Trust® has benefited tremendously from the work of CEO Barbara Kimmel who has targeted the best human resources in the leadership industry to meet all your needs. You’ll also find practical, trustworthy “do-it-yourself” activities to invigorate a culture of trust, one that will gift you with the aforementioned bullets and more. TAP THE BUTTON AND BE COUNTED! Join us in our commitment to elevate trust. 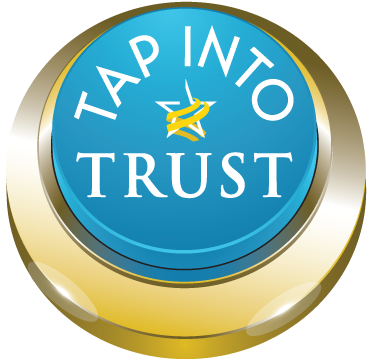 Help us and Trust Across America reach our goal in the Million Taps Campaign™.